Burren Way Cottage in Bellharbour, County Clare sleeps 6 people. Set in the heart of the famous Burren, Burren Way Cottage is a detached holiday cottage is one of a cluster located in the village of Bellharbour. Enjoy exploring the landscape of the Burren with its wonderful diversity of flora and visiting the local attractions. Within easy reach are the Ailwee Caves, Corcomore Abbey and the famous Cliffs of Moher. It is also a popular base for hill walkers and for touring the coasts of Clare and Galway. The village has a white, sandy beach and all necessary amenities can be found within a short stroll. The shop and pub are 200 yards, with the restaurant being 2 miles from Burren Way Cottage in Bellharbour. Ground floor: Living room with patio doors/dining room with tiled floor. Kitchen with tiled floor. 2 double bedrooms. Bathroom with shower over bath and toilet. First floor: 1 double (5ft) bedroom with en suite shower room and toilet. Open fire in living room (no fuel provided). Electric central heating and electricity by meter reading. Bed linen included. Towel hire. Travel cot on request. Freeview TV. Electric cooker. Combi microwave/oven/grill. Washer/dryer. Fridge/freezer. Lawned garden with patio, sitting-out area and furniture. Shared 1-acre grounds. Parking (2 cars). No smoking at Burren Way Cottage in Bellharbour. Pets allowed at Burren Way Cottage. For a better idea of where Burren Way Cottage is, you can see Burren Way Cottage on the map below. 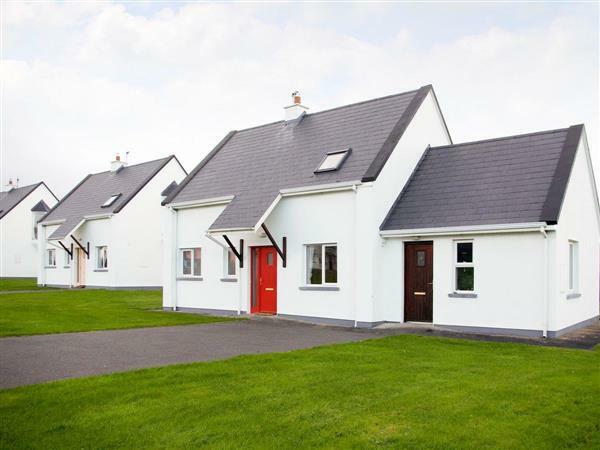 Do you want to holiday near Burren Way Cottage (W32146), you can see other cottages within 25 miles of Burren Way Cottage; have a look to find your perfect holiday location.